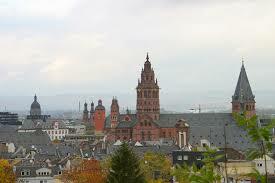 Mainz is the capital of the state of Rhineland-Palatinate in Germany. In antiquity it was a Roman fortress city. 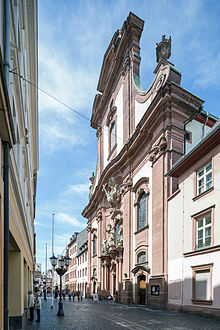 Dom St. Martin is Mainz’s world-famous cathedral with an octagonal tower and built of deep red sandstone from the 12th century. It represents the Romanesque style. Inside you can find the Diozesanmuseum featuring artwork from the cathedral as well as sculptures. In the Schatzkammer visitors can see bejeweled ritual objects dating from the 10th century. 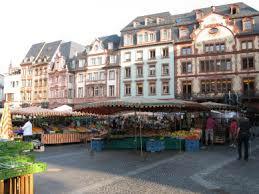 Near the Dom are three market places. 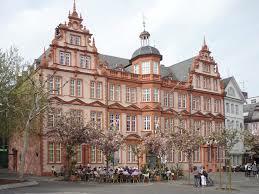 One is The Hoefchen or Little Court where the residence of Mainz’ archbishops was located until the 15th century. 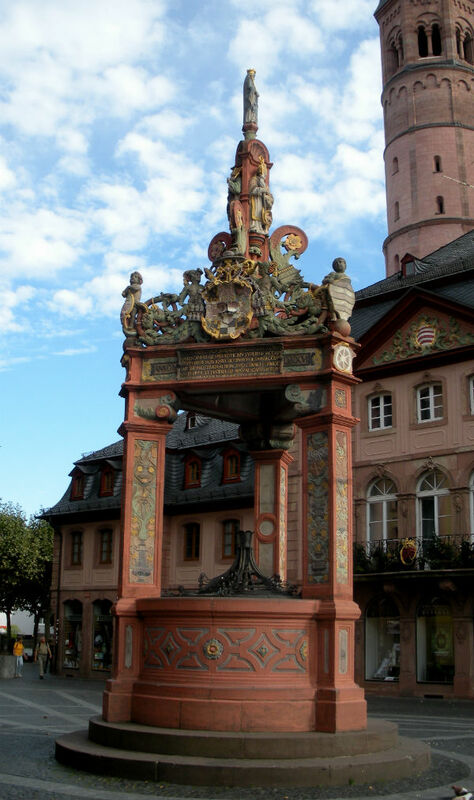 A bit farther on is the Markt Place which has the market fountain made of sandstone and is one of the oldest and most beautiful Renaissance fountains in Germany. The Gutenberg Museum displays early printed masterpieces like three extremely rare and valuable examples of Gutenberg’s original 42-line Bible. There is a quarter-hour film available in seven languages. At the museum you can try out your hand at Gutenberg’s technology and see craftsmen produce posters, certificates and cards. 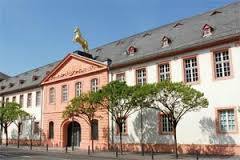 One of Germany’s most enjoyable state museums is the Landesmuseum Mainz. Some of the highlights here are an ensemble of Jugendstil (Art Nouveau) pieces, impressive collections of Renaissance and 20th century German paintings and Baroque porcelain and furniture. Visitors can delight in rare artifacts from the Merovingian and Carolingian periods including 4th to 7th century tombstones in Latin. Mainz’ illustrious medieval Jewish community is represented by gravestones from the 11th to 13th centuries. 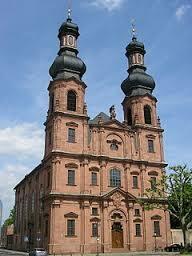 Built in 1748 The Church of St. Peter is an impressive example of the Rococo style. It is known for its richly decorated and gilded pulpit and altars, putti-decorated columns and white-and-pink color scheme. The Mainz Art Gallery stands on the city’s bonded port and looms above everything. It was created by Berlin architect Gunter Zamp Kelp and has a 21 meter high tower, slanting at a seven degree angle and covered with green glass panels. The gallery hosts touring exhibitions of contemporary art. “Sekt” is the German word for sparkling wine and its Museum of Sekt is located in the headquarters of one of Germany’s oldest sparkling wine companies the Sektellerie Kupferberg. The museum offers visitors a look into the history of sparkling wine as well as tours into the historic wine caves and deep vaults. The museum features huge, decorated oak wine barrels and a collection of more than 600 different kinds of champagne glasses, making this one of the largest collections in the world. 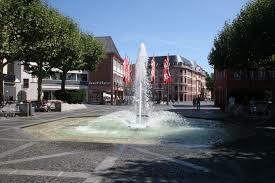 One of Mainz most beautiful little squares is The Kirschgarten or Cherry Garden. 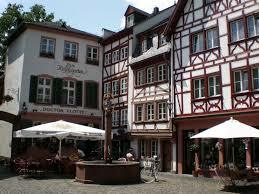 It is surrounded by romantic half-timbered houses and Marian-Fountain. At one time this spot had a cherry orchard from which it got its name. The remaining stump of a cherry tree can be found by the Zum Beymberg Bakery. 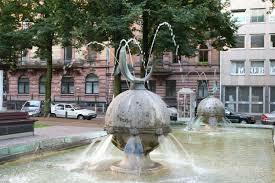 There are lovely, decorated shops and a Baroque fountain that was built in 1932. 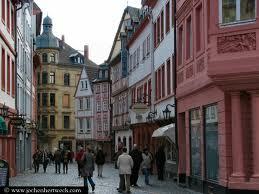 A most picturesque street for strolling is what is known as Mainz’s “stroller’s mile” Augustiner Street. Until the 17th century this street was the city’s main business thoroughfare. As you stroll along you can see small businesses and boutiques, shops, cafes, pubs, restaurants, taverns and wine houses. Along this street you’ll find the impressive Baroque facade of the towering Augustiner Church. 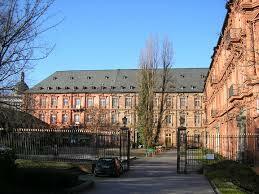 It was built for the Augustian monastery between 1768 and 1776. Today it is a seminary church. Inside there are lovely ceiling frescoes depicting the life of St. Augustine as well as the history of the mendicant order that made their home here. 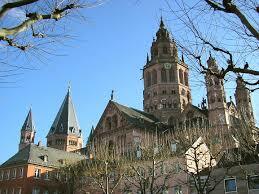 You can take a wonderful journey through Old Mainz’s historical inner city. The Old Town starts in the shadow of the southern facade of the Mainzer Dom and stretches to the Mainz-South Rail Station. There are interesting narrow alleyways with amusing names such as Little Nose, Herring’s Fountain Alley and Corpse Yard. The Old Town is always lively and you can wander through boutiques and shops. You can also relax in cozy, ancient wine bars and taverns. Downstream from the Theodor Heuss Bridge is The Electoral Palace is the former city residence of the Archbishop of Mainz, who was Prince-Elector of his elector state within the Holy Roman Empire. This is one of the most important Renaissance buildings in Germany and is one of the last examples of German Renaissance architecture. Today it is home to the Roman-Germanic Central Museum founded in 1852. The museum informs visitors about German history dating as far back as the Stone Age. Some of the highlights are collections of pre-historic and Roman antiquities. The collections are displayed in two major exhibits – the Roman exhibition that focuses on the military expansion of the Roman Empire and its dealings with other cultures and includes a replica of a Roman organ and the Late Antiquity and Early Medieval Period dealing with Roman relations with Pagan religions and Christianity. 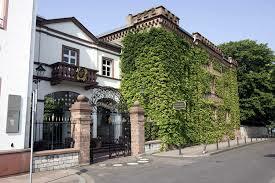 You’ll find two old towers in Rheingoldstrasse that once formed part of the town’s fortifications. 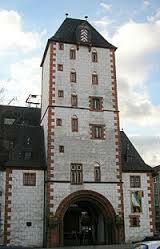 The oldest tower is the Eisenturm or Iron Tower built in 1240 and was named after the former Iron Market held nearby. It was built to serve as a watchtower and gateway into the city and also served as a prison. Presently it is used for art exhibitions and community events. 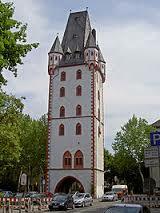 The Holzturm or Wood Tower was named after the wood stored next to it on the banks of the Rhine. Its Gothic appearance dates back to the 15th century. It was also a watchtower and today serves as a place for community groups. 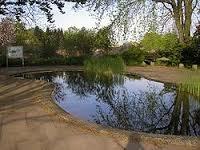 The beautiful Botanischer Garten Mainz is part of the University of Mainz. It streches for almost 25 acres and was created in 1946. It was once a former military training ground. 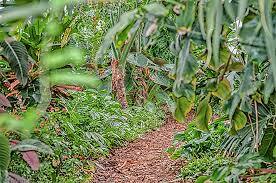 Today you can see the gardens that include 8,500 species of plants from regional species to tropical varieties in various greenhouses. Some of the highlights here are the large arboretum and an alpine garden. Thank you, I am so delighted, again you have highlighted one of my favorite cities that was very near me when I lived in Bitburg and Trier. Incredibly lovely photographs! Danke! You welcome. Glad you enjoyed. If I can I always try to get the best Wiki images from Google.